For centuries the dense, sprawling jungles of the world have captivated explorers, conquerors, scientists, and artists. Representing some of the most diverse ecosystems on the planet, jungles are home to millions of unique species of plants, amphibians, birds, and exotic predators. That’s not an exaggeration – over five million documented plant and wildlife species call the jungle their home. The views are breathtaking, the wildlife is jaw-dropping, and the environment is unforgiving. Traveling to the far reaches of the Earth in search of the ultimate adventure? Consider a trek through some of these truly fascinating jungles. Take proper precautions before you go, and research some of the unique wildlife in the world’s most amazing jungles below. If you’ve recently rewatched Gorillas in the Mist (or, let’s be honest, Mighty Joe Young) you may be itching to befriend a peaceful gorilla of your own. Volcanoes National Park is perhaps the most frequented destination in Rwanda, as it serves as one of the few safe havens for the majestic mountain gorilla. Plan a trip with a group to set out on a safari, tracking gorillas and viewing them in their natural habitat. Made famous by the work of Dian Fossey in the 1960s, Volcanoes National Park contains active volcanoes, which shouldn’t come as a surprise given the name. The volcanic massif, also called the Virunga Mountains, borders Rwanda, the DRC, and Uganda. Mountain gorillas were officially documented for the first time in 1902, spurring immediate global interest. They are called mountain gorillas because they tend to live at extremely high elevations, on volcanoes and in bamboo forests. The precise population of this species is known, as conservations go to great lengths to keep the gorillas safe from poachers. About 480 mountain gorillas currently reside in the Virunga region, in Volcanoes National Park and Mgahinga National Park. Around 880 total mountain gorillas are alive today. Unfortunately, the gorilla population is in serious jeopardy due to aggressive poaching over the last century. Conservation groups are vigilant in the area. Check online as to the current conditions before you plan a trip. The iconic Amazon is synonymous with jungles and rainforests. The Amazon stretches throughout 9 countries in South America, but is primarily located in a vast expanse of Brazil. Home to tens of thousands of unique species, The Brazilian Amazon has the honor of being one of the most biodiverse ecosystems in existence. In fact, 10% of the world’s biodiversity is located in the Amazon! The Amazon River is one of the most striking and important water sources on Earth – about 15% of the total water discharge in the ocean comes directly from the Amazon River. The intricate river systems attract countless tourists each year. Take a boat cruise or get down and dirty and explore the Brazilian Amazon on your own. Prepare for the heat and humidity, and research the safest routes before you go. It’s difficult to choose just one species within the Amazon to focus on, but these intimidating cats native to Brazil are some of the largest and fiercest predators out there. Jaguars used to occupy a space spanning from the southern tip of South America to the United States-Mexico border, but now they are primarily found in the Amazon Basin. The name “jaguar” comes from the Native American word yaguar, which roughly translates to “one who kills in a single leap.” Jaguars’ spectacular fur patterns and their hunting prowess made them central figures in the local cultural mythology. In some early Native American cultures the jaguar was considered the God of Night, or the God of the Underworld. If you go on an Amazon river cruise you may spot one, but these predators like to stay out of sight. The Monteverde Cloud Forest Reserve in Costa Rica is the kind of picturesque jungle you imagine on the front cover on National Geographic. Located within the Puntarenas and Alajuela provinces of Costa Rica, The Monteverde Cloud Forest Reserve is home to thousands of species of birds, plants, amphibians, and insects. While exploring the lush underbelly of this jungle or while surveying from atop one its signature bridges you may spot ocelots, tapirs, macaws, and howler monkeys. But wait, you ask: what exactly is a cloud forest? This name is given to specific jungles like Monteverde whose atmospheric conditions (coupled with its tropical mountainous environment) create a consistent low-hanging cover of clouds. In this environment explorers feel apart from time itself. The quetzal is perhaps the most notable species of bird within the Monteverde Cloud Forest Reserve. Identified by its resplendent colors, the quetzal was considered a deity by many Pre-Columbian civilizations in Mesoamerica. You’ll be able to tell if it’s mating season by looking at the tail feathers of male quetzals – when they’re trying to impress a mate male quetzals grow a train consisting of two tail feathers that can trail as long as three feet! The quetzal is actually the symbol of the nation of Guatemala, and the currency of the country is actually called the “quetzal.” But only in cloud forest reserves like Monteverde do the populations of quetzals remain fully intact, as their habitats are preserved. Hundreds of unique species claim the jungles of New Guinea as their home. After all, the island is covered in jungle – over two-thirds of the land is undeveloped jungle. If you venture through the area you may be able to spot marsupials. New Guinea is the closest island to Australia, and is the only other place on Earth where kangaroos and other marsupials live in the wild. This fact is frequently cited to support the theory of Pangaea. You don’t have to be a wildlife enthusiast to enjoy a trip to the New Guinean jungle – several native cultures populate the island and have remained roughly unchanged for centuries, making it a worthwhile trek for those with a passion for history. As stated above, many of the mammals on New Guinea are closely related to the marsupials of Australia, like wallabies, rodents, and opossums. There are six separate species of tree kangaroos, however, that originated from the island. Resembling monkeys to the layman, tree kangaroos are at home among the branches and leaves of tree canopies. Tree kangaroos can seemingly fly from tree to tree with incredible agility and accuracy. Unfortunately, habitat destruction and hunting have severely depleted the population of tree kangaroos. Already considered rare, tree kangaroos are rapidly disappearing as these jungles are cleared and their habitats are threatened. Tree kangaroos are significant for being the only species of macropod that ultimately returned to dwelling in trees, unlike kangaroos and wallabies. If you feel like emulating Mowgli and meeting some furry friends of your own, book a Jeep tour and prepare for adventure. In addition to Bengal tigers you may spot leopards, antelope, bison, deer, bears, and foxes. This jungle may not strike you as the standard wet variant – the jungles of Bandhavgarh are mostly dry, sparse, and thick with trees. Wildlife enthusiasts travel from every corner of the globe for a chance to spot a Bengal Tiger at Bandhavgarh National Park. Also called Indian tigers, Bengal tigers are native to India (obviously). The tiger population in general is severely threatened – three of eight tiger species went extinct during the 20th century, and the total population of tigers has dwindled from hundreds of thousands to about 2,000. About half of all tigers in the world are Bengal tigers. Bengal tigers served as the focal point of regional spirituality and lore, in a similar manner as the jaguar in South and Central America. Bengal tigers are voracious hunters – when a Bengal tiger is famished they could eat as much as 60 pounds of meat at once. If you’re a pop culture buff you’ve likely explored many parts of the Puerto Vallarta jungle from the comfort of your couch – the action film Predator, starring Arnold Schwarzenegger, was shot entirely on location in this behemoth jungle. Many films have selected Puerto Vallarta as their set, and for obvious reasons – the lush, overgrown jungle and the pristine beaches are a feast for the eyes and enough to make any travel junkie clear their calendar and buy the first plane ticket there. Jungle hiking and guided tours are both extremely popular. Another plus: the city center of Puerto Vallarta is a booming, sophisticated metropolis conveniently located next to the jungle you’re itching explore. Spend the day entrenched in plant and wildlife, and then curl up in the comfort of a 5-star hotel. You’ll stumble across no shortage of wildlife species in the Puerto Vallarta jungle, but few are as adorable and as memorable as the spider monkey. 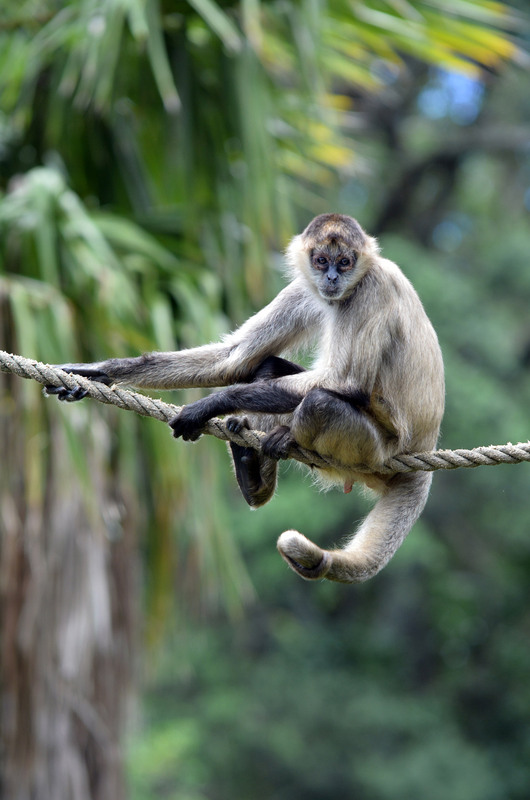 Located in jungles and rainforests from lower South America to the middle of Mexico, spider monkeys carve out a living in tree tops twenty-plus feet above the ground. Their prehensile tails make gripping branches a simple task, empowering them to hop from tree to tree without a care in the world. While trekking in the jungle you’ll no doubt hear the call of a spider monkey – the species is particularly loud, communicating with others of its kind through high-pitched shrieks and screeches. This peaceful animal feeds off of foraged nuts, eggs, and insects they find in tree canopies. Kakadu National Park in Australia several distinct biomes nestled within it. As you traverse the park, which clocks in at over 7,000 square miles in area, you can find yourself in the heart of a jungle, splashing through wetlands, swimming through rivers, and walking through sweeping grasslands. More than half of Kakadu is designated as Aboriginal land, and is home to cave art that dates back tens of thousands of years. Declared both a UNESCO site and a World Heritage Area, Kakadu National Park contains the largest river system – the South Alligator River – completely contained and protected by a National Park. Humorously, there no alligators in Australia, but the river systems are crawling with crocodiles. The man who named the river system could not tell the two species apart. Though there are huge river systems within Kakadu National Park, swimming is not recommended. Mighty saltwater crocodiles occupy almost all of the waterways in the park. The largest reptiles in the world, saltwater crocodiles are considered the most dangerous and deadly animals in Australia (which is saying a lot, considering the size and aggression of common Australian wildlife). Male crocodiles can reach the staggering length of 6 to 7 meters, making them some of the most efficient and frightening predators in the world. In fact, their jaws can exert pressure exceeding several tons. Less than 1% of crocodile hatchlings actually reach maturity – in their infancy many saltwater crocodiles are eaten by goannas, turtles, and territorial mature male crocodiles. Consider a trip to one of the world’s most intriguing jungles, but always be careful and follow safety protocol. Happy exploring!